Our current ad ruminates on the issue of artistic merit. 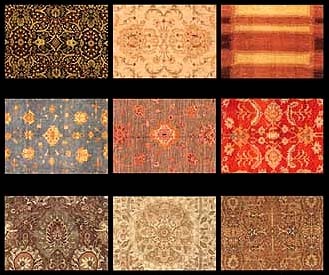 Without prejudice to taste, technique, or a multitude of other tangible and intangible factors that can affect the price of a particular objet d'art, we personally would argue strenuously that the disparity in pricing between Mark Rothko's "Untitled #17" and the equally unique, anonymously produced "Handmade Persian Rug" is too broad and, if realistic for the painting, grossly unfair to the rug. As a suggested "equalizer", we could propose a "Look for Less Challenge", and invite all takers to attempt individually to create a reasonable copy of Mr. Rothko's opus along with the more humbly estimated rug. We suggest that such an effort would confirm the incredible value in the rug -- if the price of the Rothko piece (fetched at auction) is a true estimate of value. The following link is to a scan of two articles printed just a few pages apart in the May 14-15 Saturday and Sunday Wall Street Journal. Page One of the .pdf reviews art auction results totalling $1 billion over two weeks for impressionist and abstract works from various artists. Many new records were set. Page Two of the .pdf (which actually appeared a few pages prior in the WSJ) is captioned "Not a Millionaire In Sight" and shows an "Untouchable" Indian woman crossing a precarious footbridge over an open sewer filled with human waste to her "home" on the other side. Without judgement or prejudice for or against either depiction of fortune, the juxtaposition of extravagant indulgence with abject destitution -- apparently unintended by the WSJ editors -- is poignant. special room you're fixing up this summer. 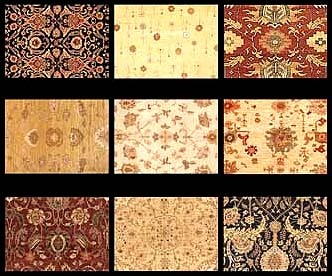 vast rug collection presently in our inventory. SAVE 20% OFF tag price.